Well, we finally got some rain in the early evening yesterday. Not just a little, but a good steady rain that quenched the earth's thirst. It seems it had been weeks since we had a rain like that. Too bad some could not have fallen on our friends in Texas and Oklahoma. They need it worse. 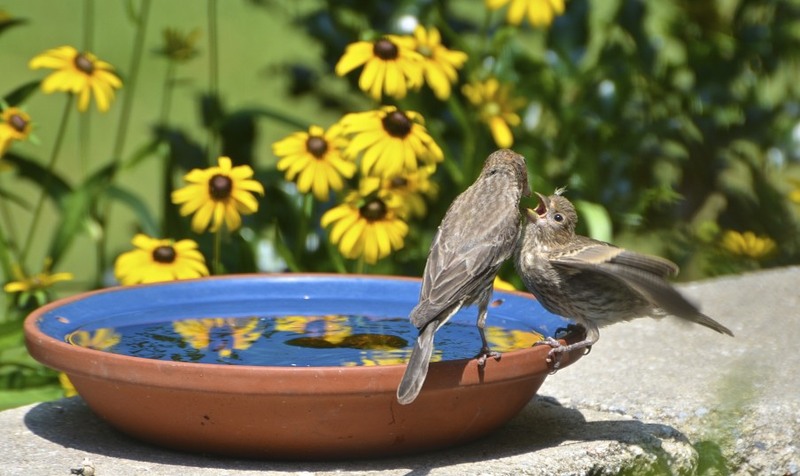 My backyard bird population seems to have quadrupled with tweety bird teenagers still hanging around home expecting a free hand out from mom and pop. This little finch caught my ear with all the ruckus he was making. He was so loud following his mother all around. They landed here where she finally fed him. By the way, notice the flower reflections in the bowl. I hadn't until now. Pretty neat! But that didn't shut him up. I personally think she's trying to ditch him. I certainly would if my kid was squawking at me like that! Thanks to all of you who have been stopping by. I love reading your comments and hearing what you have to say. I may be a bit slow visiting all of you this week as I have 3 grandkids from Cincinnati coming to spend a few days. Grandchildren can be so wonderful and at the same time, exhausting! At least if they start squawking like this unruly teen, I can just turn them back over to their parents! Oh, the joys of grandparenthood. Sweet justice prevails! Oh Reena..these are wonderful photos. So sweet to be able to watch the baby and mama interact like that. The yellow reflection of the flowers in the blue bowl is stunning. Enjoy your grandchildren! LOL...there's one in every bunch! These are awesome shots, Reena. Really tell a wonderful story. Have fun with the grandbabies. LOL!!! good luck with the little squawker visitors! i'd need lots of naps! P.S. Could you please send some of that rain to Greece please - I'm longing for a good soak and a misty day. Fun pictures! Thanks for sharing! I totally understand about the grandkids...We just had 7 at our house last week for 4 days, and I think it took me 4 days to recoup. Poor Mom, she needs some "me time." Lovely having your Grandkids with you. Have a great time with them. Great reflections in the water! 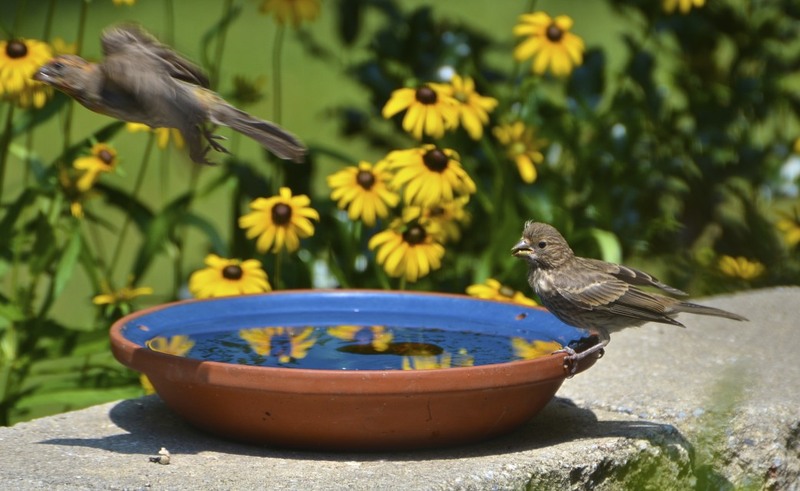 Those black-eyed susans reflected in that blue birdbath make for amazing photos! Ha! I look forward to those days, just have to get the kids married off first. I like the reflections in the bird bath. Very nice. Great shots, you capture their characters so beautifully. Pretty picture of a "couple" discussing what they would have for lunch. What beautiful pictures. I love the reflection of the flowers in the water. We had a ton of hummingbird aerobatics during supper last night. Those little jewels are absolutely amazing birds. It kinda reminds me of an old married couple. Hilarious. He isn't giving up, is he?! What fun pictures. First of all this made me laugh out loud! We have bird teens and they are loud! Parents saying get out and stay out!! Love the photos and the reflections of the flowers in the bowl is just amazing. Oh and enjoy the Grands and yes send them back to Mama! That little one loves your place, complete with pool! Great shots of these two birds interacting! I love the sunflower reflections! Have fun with your grandchildren - we are on a similar mission this week-end! 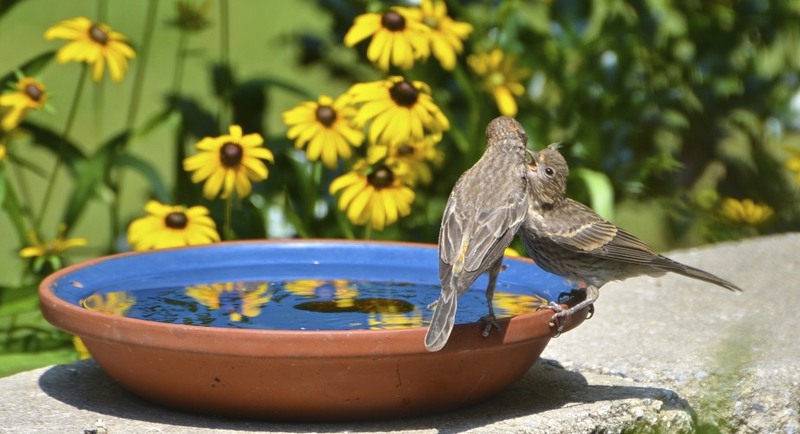 Lovely piece of avian interaction at the bird bath. Oh, thats so funny, even kid birdies do the same!! Yah, that would get old with me too!!! Have fun with the grandkids, they are wonderful. We have 6 and 3/4 (one due in Oct) LOL and I have a sign in my LR that says: If we knew that Grandkids were going to be this much fun, we would have had them first!! LOL So true!! And yep, thats the beauty of it, you CAN turn them back to Mom and Dad!! yay!! 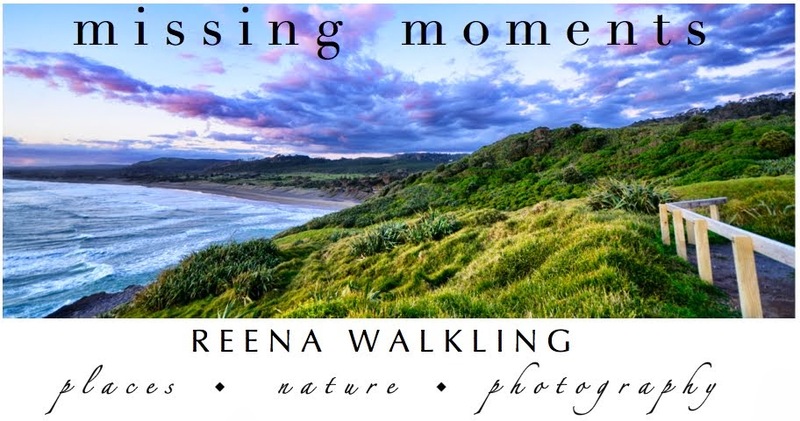 Such delightful photos, Reena! Love that little guy with the big mouth!! Hope you have a good visit with your grand kids. I have four children, but no grandchildren and people are always asking if I don't miss having them and I have to say that one doesn't miss what one never had!! Enjoy your week! Love your bird photos...what fun. Have wonderful times with your grandchildren. Hope it cools off a bit for some outdoor enjoyment. Beautiful photos, such a greedy baby! he certainly looks big enough to leave home. I enjoy these photos very much. he's a cutie. you've caught him at the best of times, and one in flight too. excellent. I'm happy you got some rain, isn't it refreshing? I hope you're having a joyful week with the grandkids! A lovely post Reena... the reflections in the bowl add to the images. Great post which gave me an idea above all else. We have a rather deep water feature for the birds. Medium to large birds love to flutter around in it, but the little guys have a hard time. Been meaning to get a shallow bird bath basin for a a long time. Now seeing what you have, I just never thought. I think we have one of those shallow dishes around here. Will give it a try. Thanks. Great pictures. Raising young birds has to be a pain for their parents. Mom needs to teach her daughter to be more self-sufficient, she looks almost as big a mom! 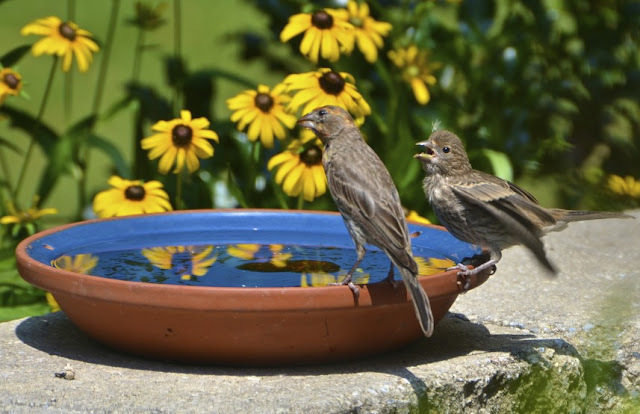 Cute shots, I enjoy finches. We get several very bright yellow one at our feeder. Gret sequence!! Boom & Gary of the Vermilon River, Canada. I enjoyed the sequence of shots with your commentary. Now if I had to listen to the squawking I might have ditched the post. Probably a bed time story in these photos. Cute birds and wonderful photos with those reflections. I'm glad you got some rain. Hi, Reena! I love your birdie shots and the reflections are awesome. The flowers are gorgeous. Wonderful post and photos. Thanks for your visit. I thought the flowers in the bowl were painted on like some Mexican motif. Pretty wild! Grandparenting is wonderful but poor Mom and Dad have to remember developing well functioning adults is the key point which your wonderful post reminds us. Great stuff! I feel quite sorry for some of the parent birds this time of the year. They seem to work non stop with the young. Those are really cool reflections. Nice series of shots! I do know about those grands. Kids are a lot of work, but the rewards are worth it. Have fun! Love that reflection in the water by the way. the photo is gorgeous. Those youngsters can be very noisy. maybe the chipmunk can set them straight. This is my first visit to your blog and it has been a delight! Your photography is wonderful! I so enjoyed the escapade with mama and child at the birdbath. The flower reflections are so beautiful in the water. I can't believe how clear and perfect the whole feathered interaction is and the last photo, with mama fleeing, is apropo! I love the reflections Reena! Have a wonderful time with your grandchildren! The reflections in the bowl really add to these shots. I can just hear the squawking. Hope you will post photos of the kiddos. Great captures of the finches Reena! I love this time of year watching the parents bring all their little chicks to the bird feeders. Loving the flowers reflected in the water. Enjoy your grandkids! What a blessing. that is a great shot!! That little one is persistent if nothing else! LOVE these photos! That first one is just awesome.